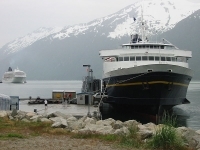 Large cruise ships regularly travel to major ports in Alaska, however a better, smaller option is the Alaskan Ferry. Departing from Bellingham Washington, these large ferries travel around the major coastal towns of Canada, the Gulf of Alaska, and the Alaskan Peninsula. The landscape is staggering, revealing hundreds of craggy forest-dense islands and coastlines. Eagles, killer whales, bears, and other wildlife are all part of the view. The months of operation are May to September, when the weather is bearable and sunshine illuminates most of the 'night' hours, making the days long so there is plenty of time to fit in lots of sight-seeing. Costs vary greatly on length of voyage and accommodation. Most ferries rent cabins, but those in tune with Alaska's pioneer spirit can pitch a tent on deck or just use a blanket. However, if you do choose to go with a cabin, there are some very comfortable options available. It's possible to plan an extensive tour of Washington's, Canada's, and Alaska's coast lines, stopping off at various points of interest along the way. Special fares are available throughout the year upon request.